No need of configuration - It just uses the last location of your smartphone, the in-built GPS sensor or even the next webserver. 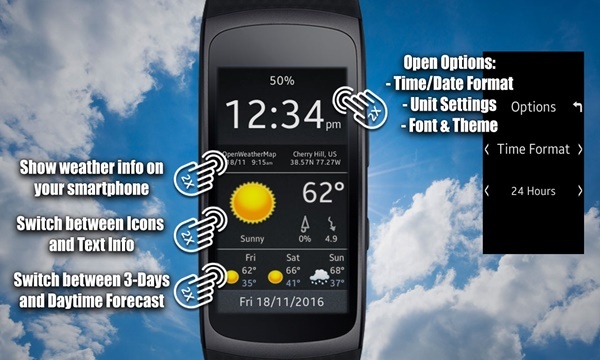 No need of a companion app - The weather will be updated once a day via WiFi or your paired smartphone. See the forecast of the next 3 days or the next daytimes (morning, noon and evening). With a double tap on the upper area, you will go into the options. Here you can change the units for Temperature (Celsius,Fahrenheit), Windspeed (m/s,km/h,mph,kn) and Pressure (hpa,in,mmHg,PSI). Also the theme, font, icon sets and the time/date format. In the Ambient mode you see the current temperature and the weather icon. One look and you know what you wear best.